10 Ways To Get Quick Headache Relief ... Naturally! Why essential oils are the perfect way to relieve a headache quickly. Chase away your headache without drugs or prescriptions. Why this ancient natural method is gaining popularity. You will receive 10 specific remedies you can begin using today! 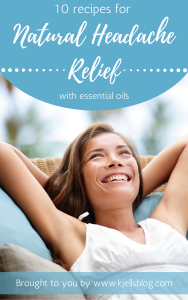 You will also receive our free email series on better health with essential oils.